Well, as of today I begin as Minster Priest. I am feeling both well-beloved and notorious-by-association. 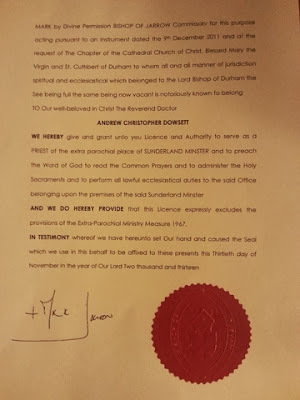 Thank you to everyone who turned out to make today such a special occasion: to the people of Sunderland Minster and Durham Diocese for inviting me; to the people of the city of Sunderland for such a warm welcome to us as a family; and to all those who travelled a greater distance to be with us. Angels have a certain ‘currency’ in our pluralist society, which, to the frustration of some, is both post-Christian and post-Secular. The form with which we have envisaged angels has changed many times – angels are ubiquitous, but no longer Victorian angels sitting on clouds wearing white nightgowns and playing harps; which were in their time quite distinct from Mediaeval angels – and this in itself points both to an enduring ‘need’ for angels and to an evolutionary impulse that ensures their survival. The writers of Dr Who brilliantly subverted the angel image with the Weeping Angels, aliens who take the form of ‘angel’ statues, moving at terrifying speed when their victim blinks – don’t blink! – and killing by transporting you to another time in which to grow old and die, separated from your loved ones. Are angels comforting, or frightening? Perhaps our turning people into angels separates us from the difficult but life-giving relationships with flesh-and-blood humans? This Angel resonates with our need for angels. But Gormley unpacks that need in terms of a disruption – travellers going about their everyday business pass this angel at a rate of more than one person per second – that connects us to the past, to the future, and to our hopes and fears. 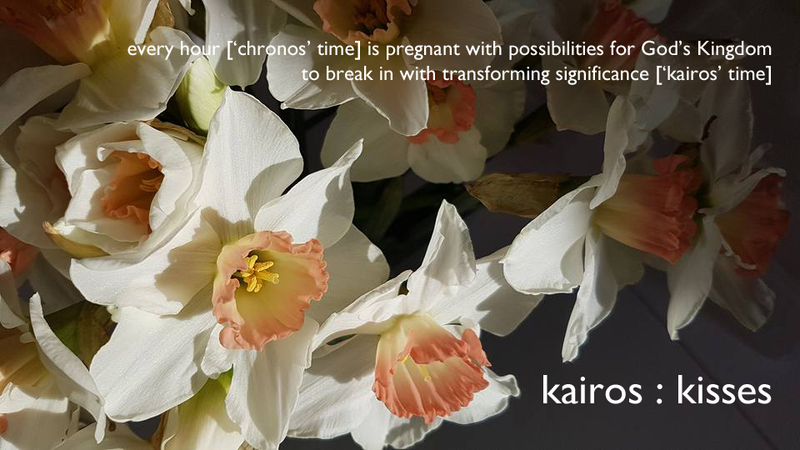 *“Desire’s balancing point between past and future means that it can only exist as a gift nourished by a promise.” Revd Dr Jessica Martin, prologue to the Pilling Report (Report of the House of Bishops Working Group on human sexuality), p. xv. We are huge Dr Who fans in our house. And this weekend has been epic. For eleven days – one for each Doctor to date – we counted down to Saturday and the fiftieth anniversary feature-length episode. And we were not disappointed. Just as last year, on the fiftieth anniversary of the James Bond films, Skyfall re-booted the most iconic series in British cinema, so The Day of the Doctor – along with its mini-episode prequel The Night of the Doctor – was a landmark event for the most iconic series in British television. And as testimony to its cultural significance and appeal, it was simultaneously broadcast in 94 countries. I genuinely believe that understanding (not necessarily appreciating) Dr Who is essential to understanding British-ness. This show has impacted our collective consciousness for fifty years, and has gone through many changes. It started in a post-WWII world where Britain understood itself – quite self-centredly – as having defeated the Nazis and saved the world. But it takes us on a journey of discovery. Through the Doctor, we discover something about ourselves – something much more complex, with good aspects and darker aspects. Through his human companions this alien learns, increasingly in recent years, what it means to be human. It takes us from colonialism to post-colonialism. It still has a journey to go: still, every regeneration of the Doctor has been a white male (a bit like our bishops…). It charts many of the changes we have undergone as a society over those fifty years. It is about finding our place in the world, when the world we grew up in no longer exists – some critics argue that it is merely an attempt to pretend that Britain is still the centre of the universe, but if it is (and I think that a mean-spirited assessment), that centre has shifted, even if not enough for some - and learning to be good while recognising that in the name of goodness we have done terrible things. It is about redemption. It creates a myth – a framework for exploring so many things – for an increasingly post-Christian (and bereft of myth) culture. It helps us confront the monsters we face and fear. It has a profoundly Christo-centric heart, with victory through self-sacrifice and resurrection. It plunders history and science fiction for good storylines. Through characters such as the Paternoster Gang, the writers explore the reconciliation of former enemies and the appreciation and value of accepting diversity – things the Church struggles with. At one level, it is a big adventure kids (of any age) can get excited about. But, like the TARDIS, it is bigger on the inside. The Doctor is one person, who has undergone many regenerations – a different face, different personality (or, means of exploring different aspects of his personality), different costume to reflect that personality. There is both continuity and integrity of character, and reinvention. I find that to be true. I have lived and gone about my calling in different contexts, and in each context I am different – not presenting a false image, or being a self-made and re-made individual, but finding that I must grow into the person I am called to be in each new season. That person changes, in part because I am called to grow into myself, to become more fully formed, to discover by degree who God has called me to be and who he is forming me to be; and also in part because who I am as a person is shaped by the different companions sent to accompany me, some of whom are constant or recurring characters, and some of whom are passing. Often when I move location, I make changes to my wardrobe as a prophetic expression of new identity. On occasion, more than one regeneration of the Doctor find themselves in the same place at the same time – a risky thing, but sometimes necessary to overcome a particular challenge. Likewise, there are times when I need to draw on who I have been in the past but have, on the whole, moved on from. The Doctor faces certain enemies on many occasions; and yet each time it is different, because both the Doctor and the enemy are no longer what they were, and the context and companions have also changed. This, too, I find to be true. Life is a battle, at times, and there are certain monsters we face over again, and yet each time is different. There are no formulas. The Doctor also meets friends in different points in time; and for me this is akin to coming to familiar points in the Church year – Advent, Christmas, Epiphany, Lent, Passiontide, Easter, Pentecost, All Saints – on a regular basis. Each time is fresh, because I have changed. The Doctor is compelled by a vocation, to stand between worlds – but primarily this world – against destruction. And as a disciple of Jesus, there is something in that, even if I am not the character at the centre. There are things about the Doctor that I don’t like. Of course there are. There are things about myself that I don’t like, that I don’t like to face up to, that I run from – and that I will have to confront at the appointed time and place where, wherever I run, I will arrive at. There is a time and a place, God knows – and we cannot force either and it go well. I would love to see a female Doctor – just as I would love to see female Bishops, something we might get sooner. And yet Chris was the perfect choice to bring the Doctor back, David to take him on, and Matt was simply inspired casting…and so I await the time, confident that it will happen. So, I am unashamedly a Whovian. Indeed, I get emotional when all the Doctors come together in a storyline, as they did at the end of the fiftieth anniversary, despite the fact that three were before my time, despite the fact that I haven’t watched every episode or ever gone to a fan convention. It just resonates with something inside me. Being British, for ill or good, most likely. 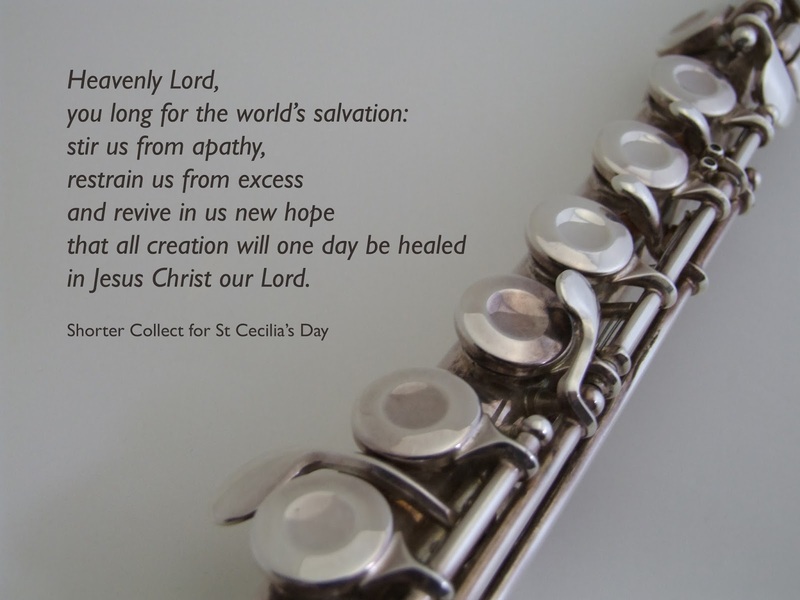 Shorter Collect for St Cecilia’s Day, 22 November. Yesterday evening, I caught an article on Stag Beetles on Countryfile. Stag Beetles spend six or seven years as big fat grubs underground, eating dead wood, an essential role breaking down fallen trees so that we aren’t eventually overwhelmed by them. Then they form a cocoon, and six weeks’ later emerge as a large beetle. The Stag Beetle only lives as a beetle for about four weeks, during which time its sole purpose is to reproduce. It made me think about death and resurrection. Jesus talked about death and resurrection a lot. His call to followers was to come and die. On a daily basis. In other words, not a one-off thing. Not a life-after-this-life thing. A this-life thing. Not that I don’t believe in life beyond death; but that I believe in a life defined by death and resurrection. This is not abstract. It is personal, lived, over and over. As a family, we have just relocated from the North West to the North East. We have died to one life, and been raised to another. We have died to a life that was familiar, where we knew who we were – because who we are, as persons, is defined in relation to other people, not self-defined, nor even defined by God alone because God who is community places us in community – and were known. God has uprooted us, and replanted us. And here we are not yet known, and have yet to discover who we are called to be. Sometimes we put up a fight, resisting dying, dying to self. We will not forgive that person, until we are exhausted in our unforgiveness, quite spent. But ultimately we cannot hold off death. In the end, we die. In the end, we die to our unforgiveness, when God steps in and slays us with his forgiveness. Sometimes we resist dying. But I notice something else. Sometimes, perhaps far more often, when we have died and have been raised to a new life – a fresh start, a new beginning – we resist leaving the tomb. After all, we have no choice over the dying, or indeed the being raised to new life; but we do here. The tomb, the cocoon, is safe. To break out takes effort: I don’t know enough about beetles, but I know that when butterflies emerge from their cocoon, they must regain their strength and dry off their wings before they can discover that now they can fly. Resurrection means having to learn a new set of rules. How, do you imagine, did Jesus discover that he no longer needed to open the door, that he could walk through walls as if they were more flimsy that the set on Neighbours? Was it innate knowledge – as the butterfly knows it can fly – or discovered? The rules are different here, because the call is different here; the incarnation is different here (not dissimilar to the many incarnations of the one Doctor, if you are a Whovian). Death and resurrection is the only story in town. Even the city itself experiences it, over and over. Right now, our newly-resurrected bodies are feeling quite raw. But as we emerge from the tomb, and flex our limbs (or whatever form God has chosen, for resurrection bodies shape-shift: men and lions and oxen and eagles, to name a few) we will discover ourselves anew. Yesterday I had lunch with a Muslim hospital and prison chaplain, at the Gurudwara (Sikh place of worship). You always get good food at a Gurudwara, but if your visit coincides with the birthday celebrations of Guru Nanak (as our visit did) you are in for a special treat. We talked about the experience of British Muslims, and also about mental health and the struggles both Muslim and Christian communities have with mental health issues. And we were continually and politely interrupted by our hosts – those who welcome made our conversation possible – asking if we would like more to eat or drink. Muslim-Sikh relations aren’t always great, not helped by the way in which the white boys carved-up the sub-continent; and it was a joy for me, a white boy, to be called ‘Bro’ – brother – by those who served us. Jesus once told a story about a man who came to separate out his flock of sheep from the flock of goats belonging to someone else. In my country, breeds of sheep and goats look very different; but in Jesus’ country, they look alike to the untrained eye. But sheep know the voice of their own shepherd, right? Well, not in this story. In this story, some of the ‘sheep’ thought they were goats, and are surprised to discover who they actually belong to; and some of the ‘goats’ thought they were sheep, and are surprised to discover that they aren’t claimed by the shepherd. On what basis are the ‘sheep’ identified? As those people who welcomed the stranger, who fed the hungry, who met the physical and emotional needs of the marginalised and the lost. For when they do so, whether they know it or not, they welcome Jesus. So here was I, having arrived in this city ten days earlier, knowing almost no-one and almost no-where, sitting at table as if I were an honoured guest – which is precisely what I was. Quite unable to reciprocate. Whatever else may be going on in the very different cultural and religious ways in which people yearn for and respond to God, Jesus was made welcome and served at the Gurudwara yesterday. Things are slowly starting to settle into place around here, though my books are still in boxes. I have gone back to a simple template for the blog – it doesn’t showcase posts as nicely as the dynamic template, but it is much easier for visitors to navigate – and I’ve made four new header banners to mark the liturgical year. Yesterday was our final service at St Peter’s. We shall miss these few, fragile, faithful, friendly people. It is a special place where a great deal of healing takes place. Not a great deal of cure, but healing* - where the (for now) ‘weak’ and the (for now) ‘strong’ are made more whole by the patient and at times hard work of love. Like many others before us, we arrived hurting, and move on healed. Then, in the afternoon, I attended the annual joint All Soul’s service, to which we invite all those families for whom we have taken funerals at (or through) St James’ and St Peter’s over the past year; as well as an open invitation to anyone else. We listened to a retired vicar who spent many years among the Zulu people speak about different cultural attitudes towards those who have died: how we focus on loss, but other cultures focus on the presence of those who have died – thoughts which tie-in with my previous post. The purpose of this service was not to return to the funeral, but to recognise that presence. ‘Those whom we love and lose are no longer where they were before; they are now wherever we are.’ St John Chrysostom. We were invited to light a candle not only for them, but with them. A candle was lit for every person whose funeral we had taken, and many besides – tea lights arranged on tiles laid out in the shape of a cross. For the past seven years, I have posted a daily Advent calendar throughout Advent, which this year (not always!) starts on the first of December. I’m hoping to do so again this year, but as I start my new post on Advent Sunday, circumstances might over-take me! The full archive can be found on my blog: under 'Writing About' on the side bar to the right. *In the enabled life: Christianity in a disabling world, Roy McCloughry reminds us that it is possible to be cured without experiencing healing, and to be healed without experiencing cure; that those who long for cure can minister to others just as much as those who do not need cure; and that healing transforms the one who ministers as well as the one who is ministered to, and the community as well as the person. Yesterday was All Saints’ Day. The day we remember those men and women who were given grace not only to touch the lives immediately around them, but to have a bigger impact, to inspire others across a greater length and breadth through time and place. Legendary lives. reminded, when we have convinced ourselves that we, in the mess of our broken lives, are all sinner, and that our brothers and sisters are paper saints. Today is All Soul’s Day, or the Commemoration of the Faithful Departed. The day we remember those men and women who were part of our own local community – many of whom surround our church buildings as they await the resurrection of the dead – and those we have known personally, who encouraged us on our pilgrimage and who have gone on ahead of us for now. People talk to the dead. I don’t mean through a medium, at a séance. I mean people visiting the grave of a loved one, telling them news of family members; or the widowed, used to having a partner with whom to work things through, sat in a quiet place continuing a habit formed over years. But that is to fail to grasp what it means to be part of the Church (as we all do, in many ways). Heaven and earth are not two kept-apart realms, but two realms brought together in the person of Jesus. And if – this is a mystery – I am with Jesus, and if – again, a mystery – the faithful departed are with Jesus, then – mystery – we are together in him. And it is the most natural thing in the world to speak with those we love when we are together. Just as prayer is conversation with the Father, through the Son and in the power of the Holy Spirit; and as we pray, we may sense the Father speaking to us, prompting us, guiding us; so we can talk with those we have loved and who have gone before us, in the Father’s love, through the mercy of the Son and in the power of the Holy Spirit; and as we talk, may sense their thoughts on whatever is on our mind. That image beautifully expresses something within the breadth of Christian understanding. And yet elsewhere within our traditions is a rich heritage that would say the ocean is not a barrier; that word can travel from shore to shore. So this All Soul’s Day, as well as giving thanks for those whom we have loved and no longer see for now, why not thank them for their faithfulness, to us as well as Christ?